Born at Portland, Orgeon, October 15, 1883, he graduated from the United States Naval Academy in 1906, was commissioned an Ensign and advanced through the grades to Vice Admiral, 1941. He was known throughout the Navy as a planner and in 1940 was an observer in London, described in the press as a "mystery man," he "kept his eyes open and his mouth shut." His mission was unprecedented, since the U.S. Navy had never employed such a high-ranking observer while still at peace. In March 1942, he left his diplomatic post for a more active one in the South Pacific, his duty being to reorganize the U.S. Navy there. A Vice Admiral, he kept a low profile as he organized the assault on the Solomon Islands to save communications with Australia and New Zealand. His task was difficult, involving a landing on hostile shores and in dangerous waters, against an enemy with land-based aircraft. His planning not only preserved communications but provided bases in the Solomons for further attacks in the Southwest Pacific. 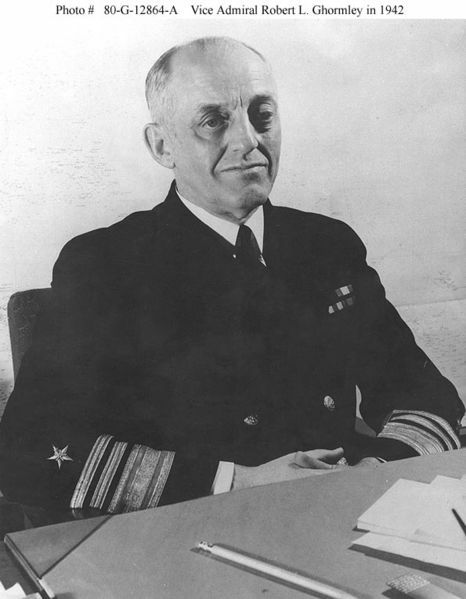 In October 1942, however, William F. Halsey replaced him. He had been deemed insufficiently aggressive during the desperate fighting on Guadalcanal. He returned to Washington to work with the Headquarters of Ernest J. King, Commander in Chief of the U.S. Fleet. Later in the war, he commanded the Hawaiian Sea Frontier, and after V-E Day, directed disarmament and demobolization of the German Navy. He died on June 21, 1958 and was buried in Section 30 of Arlington National Cemetery. 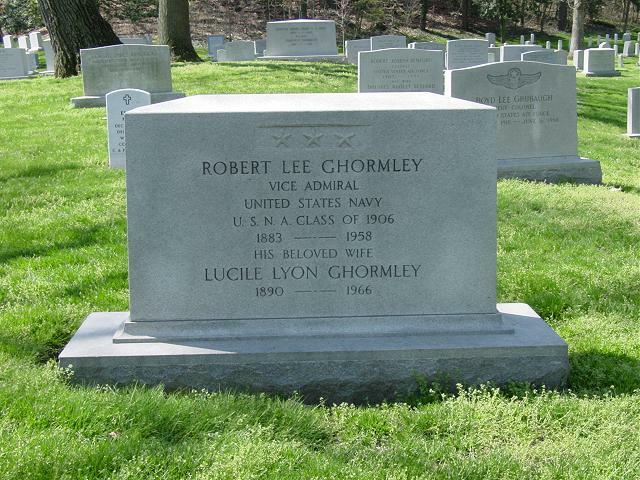 His wife, Lucile Elizabeth Lyon Ghormley, 1890-1966, whom he married on October 20, 1911, is buried with him.